Network Rail said: CJ has received already a lot of money, don’t expect more in the next 10 years! They have been deeply disappointed by the recommendation for refusal coming from the planning officers for the planning proposal from Metro Shopping Fund (Delancey). They said that (contrary to our sources) there was no plan for Clapham Junction before the Twin Towers (I was told not to use those cursed words) Delancey’s plan. Actually Network Rail (NR) worked since CP2 (Control Period 2 – funding period 2001-2004) and for 5 years (2004-2009) with Delancey and the Council to come up with a proposal. They also said that it was part of their instruction from Office of Rail Regulation (ORR) to work with third parties and private investors. The total cost of that study was £2m! They are currently spending money on a new entrance (Brighton Yard entrance) which will hopefully direct 30% of the flow of passengers entering or exiting the station at St John’s Hill currently. According to projections of ORR it should cover up to the year 2026 when the same level of congestion currently experienced will be observed again. The East London Line will arrive in platform 2 (instead of 1 as originally planned) and w ill be sharing with the over-ground. Platform 1 will stay unused as it is. However they are likely to keep the track in case it is needed in the future. Plans for Heathrow link are still under discussions and there is no confirmation that it will stop at Clapham Junction (again, this is not what we heard). The number of overground trains going to and coming from Willesden Junction should double (NR proposes to restore double track to the “Latchmere Curve” during the summer of 2010. This will enable the frequency of overground services to Willesden Junction to be increased to 4 trains per hour from 2011). 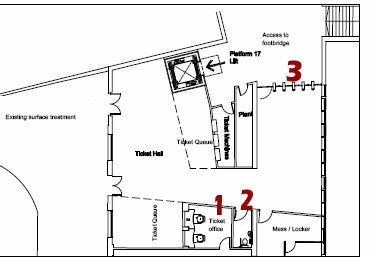 The cost of the new entrance is £1.5m with £500k coming from the government, £300k from the Council (not redirected from the Exemplar Scheme as we might have suspected previously) and £700k coming from various funding, including TfL and London Heritage (?). NR made very clear that it was the only station in the all country with “Access for All” scheme providing a new entrance. 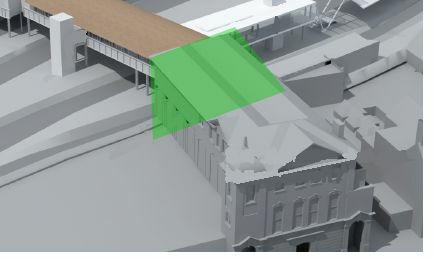 From the £2m planned for cosmetic improvement (repainting, lightening, canopies,…) some will be redirected to pay for the Brighton Yard entrance (as a cost example, a single ticket barrier is £30k). The global funding for Brighton Yard was overseen by an industry group called The Clapham Junction Forum made by NR, London Underground, TfL, SWT, Southern. Lifts are currently installed on all platforms (part of the “Access for All” government policy). Original funding from the government was £8.5m but they think now that costs will exceed this amount. Work is meant to finish in June 2010 and at the same time a temporary “smaller” station entrance for Brighton Yard will be opened (example of what it coult be in the picture below). they do not have the funding. They had some delays as they needed to destroy a café on platform 15/16 to install the lift. However as the whole station is in the Conservation area, it took an extensive (and difficult) 6 month period to get the necessary authorisation. Although the bridge is not listed, this experience makes it really unlikely that they will look for more amendments in the future. Bus stops won’t be reallocated (road to narrow) but an additional bus stop will be created before the entrance coming from Wandsworth town. 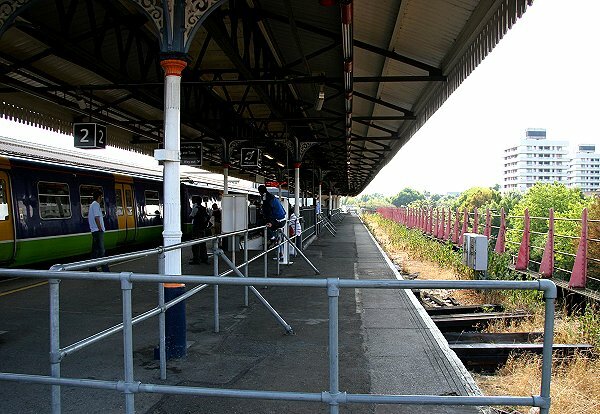 The £20m allocated to platform lengthening and straightening at CJ is no longer considered necessary and goes back to the pot of funding for all Sussex lines! They managed to realign the platform 15/16 without the land that was meant to be provided with Delancey’s plan (no talks about platforms 11/12 and 13/14 which were in funding period CP4 2009-2013 – p63). The Transport Secretary wanted to know what is happening after his announcement. At the meeting he requested (January 20th) were representations for the 10 stations included in the plan. Cllr Edward Lister (leader of Wandsworth Council) was also attending the meeting. They confirmed that Clapham Junction has been defined as the most in need along with Manchester Victoria station (receiving £10m apparently). A decision was made to concentrate on a few major improvements instead of spreading the funding on a lick of paint (although you could spend £2m repainting CJ station, they said). More stairs (from the overpass). No plans for station concourse, entrance refurbishment/extension. NR has a mission to focus on train users and passenger needs, not residents. Therefore they shouldn’t be the prime initiator for CJ station regeneration. I was told that those proposals were supported by South West Train, Southern, TfL and Wandsworth Council (Cllr Lister). You will notice that I asked if the Council thinks that providing waiting rooms and canopy extension (although very welcome) are much more important than refurbishment of Grant Road for example, I was quickly answered: “No, no, that’s not what I said“. The CJ investment paper should be signed off mid/late February. 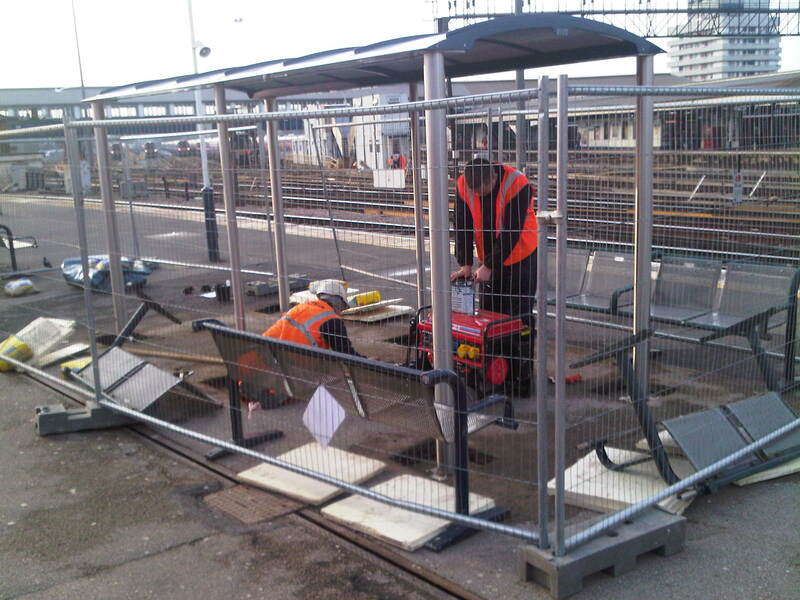 As shown on the picture taken the day of the meeting on platform 10 at Clapham Junction, they are already installing waiting area (probably part of the £2m “cosmetic” improvements). But NR was not aware of anything and surprised when I raised the point. As Robin Gisby will be in in charge of overseeing the current improvements, Paul Plummers should be in charge of defining next funding period for 2014-2019 also known as CP5. However, it was repeated several times, there won’t be much allocation for Clapham Junction station in CP5 as it already received a lot currently!!! NR said they do not see the £5-10m funding provided by Lord Adonis as an emergency funding to make the station – branded second worst in the country – up to a minimum standard. Therefore it might be seen by NR as a welcomed CP5 advance funding and could explain why they now consider that they will concentrate next funding effort on other stations. It is clear that NR considers that its priority is for passengers, not residents. They said that the local authorities should take their responsibilities if they want to regenerate the area and provide with the necessary funding. Therefore they do not intend to come forward with any plan for making Clapham Junction a better station from the outside. Of course they welcome any element of survey or consultation that we might present, but our discussion should also involve South West Train, Southern, Tfl, and local authorities. It seems that they won’t ask for any more funding for Clapham Junction station for CP5 if the Council does not come forward with some vision of what could be done and of course a beginning of a funding. After all, even if NR provided the biggest part of Birmingham New Street redevelopment, they were only focusing on the station and it was the local authorities who developed the vision, they added. Therefore it looks like they put the ball into Wandsworth Borough Council hands now! This meeting was organised by Martin Linton in view of exploring possible funding for the redevelopment of Clapham Junction Station. 2010: the industry will come with options (definition of projects and allocations). 2011: the government will examine a draft proposal. July 2012: the government will provide new specifications. 2013: ORR will review, analyse and check the funding for 2014-2019 (CP5). 2014: project implementation for CP5. ORR was very receptive to our concerns and confirmed that Network Rail is the first contact to station redevelopment and has an obligation to address projects that they receive (they get a £50m budget to do so). Of course it would be worth to involve the franchise companies (South West Train, Southern) and TfL (for overground and East London Line). Martin Linton met with Robin Gisby (Network Rail – Director, Operation and Customer Services) along with colleagues Timothy Potter and Paula Haustead, Lucy Norton (who will be responsible for delivering any improvement project to redevelop the station). Unfortunately, despite Martin Linton’s request, Robin Gisby’s office did not find appropriate for us to attend the meeting, but instead offered another date (to our request) in January (see below). The “not so good” news is that only 3 lifts should be in operation (platforms 1/2, 3/4, 5/6) with an additional two coming soon (platforms 7/8, 9/10) but there are delays on the remaining (platforms 11/12, 13/14, 15/16, 17). In addition, as the Brighton Yard building is currently used as a construction site for storage mainly, work for the new station entrance is being delayed and should only be finished by 2011 (which means that CJ won’t be step free before this date).